Sapient Capital Partners has been retained by a high-growth Canadian animal health technology company to advise on strategic partnerships to support the Company’s international growth strategy for its proprietary technology platform. Name not disclosed under a confidentiality agreement. 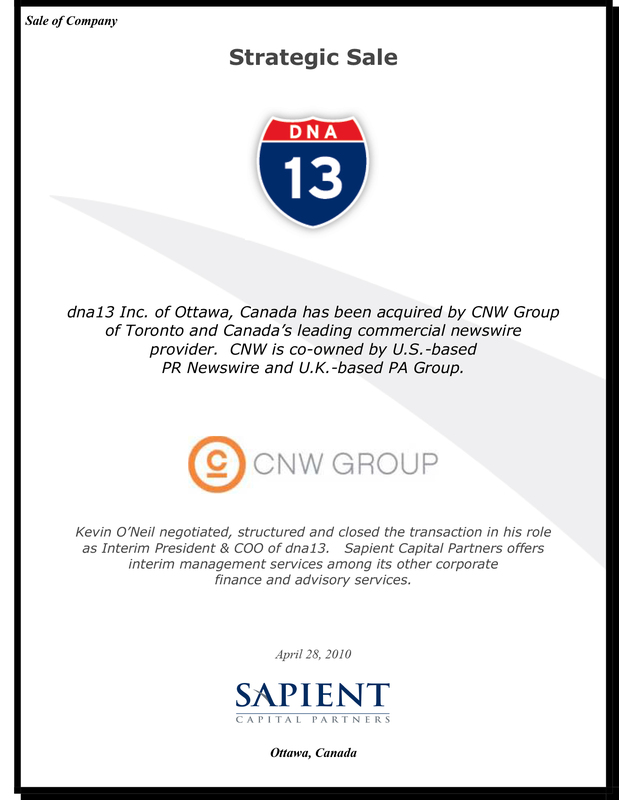 Sapient Capital Partners has been retained as the exclusive financial advisor in the sale of a long-established and profitable family-owned business information services company based in Ontario. Name withheld under a confidentiality agreement. 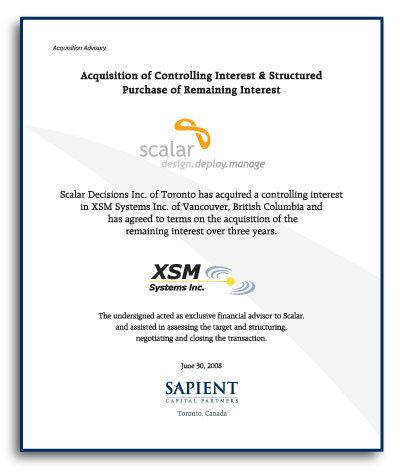 Sapient Capital Partners has been retained as exclusive financial advisor to a profitable and growing Ontario-based Industrial Internet-of-Things software company to maximize long-term shareholder value in the sale of the Company to a strategic buyer. Name withheld under a confidentiality agreement. Sapient Capital Partners has been retained to advise a private, growth-stage Platform-as-a-Service technology solutions company on capital markets and growth strategy. Name withheld under a confidentiality agreement. Sapient Capital Partners has been retained by an executive management team to advise on a Management Buyout of a longstanding, profitable veterinary technology company. Names withheld under a confidentiality agreement. Sapient Capital Partners has been retained as exclusive financial advisor in the acquisition of a long-time profitable, multiline sports equipment company. Names withheld under a confidentiality agreement. Sapient Capital Partners has been retained as exclusive financial advisor to sell a multinational e-commerce platform company. Name withheld under a confidentiality agreement. Sapient Capital Partners has been retained to advise a profitable, high-growth industrial technology company based in Philadelphia, Pennsylvania with regard to shareholder value maximization and capital market strategy in structuring and capitalizing its various proprietary spinoff technologies and subsidiary companies. Name withheld under a confidentiality agreement. 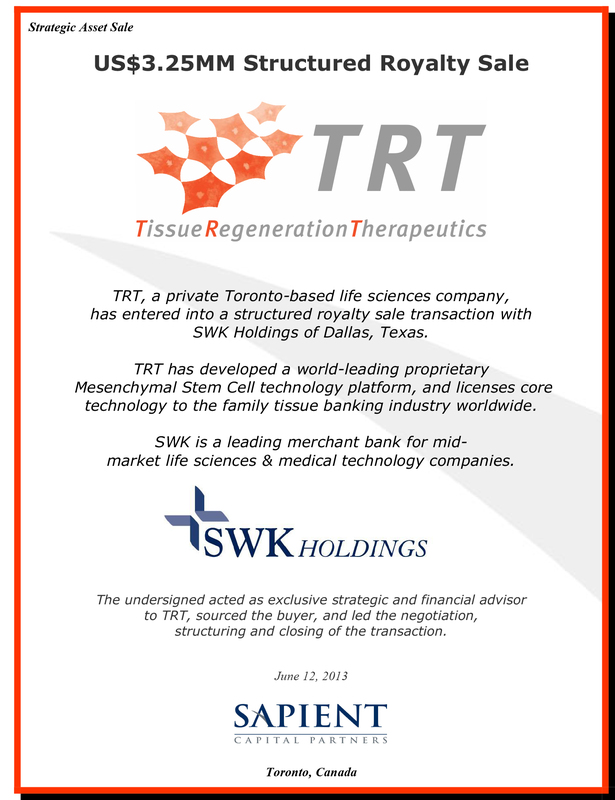 Sapient Capital Partners has been retained to provide “Virtual COO/CFO” services to a private Toronto-based life sciences company. Services include support with growth strategy & planning, governance, operations, capital market strategy and liquidity management. Name not disclosed under a confidentiality agreement. 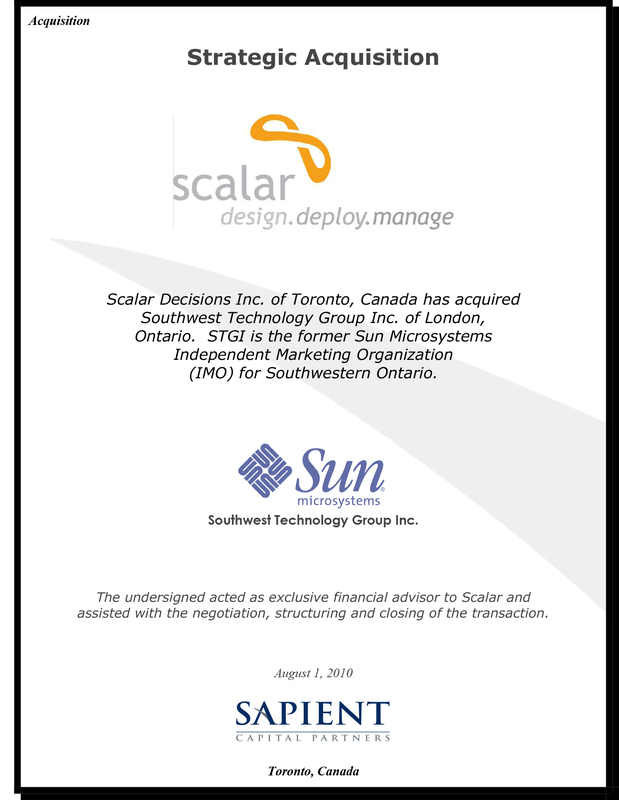 Sapient Capital Partners has been retained by a private equity group to assist it with due diligence and advise on terms of the acquisition of a significant minority stake in a Software-as-a-Service-based enterprise software company based in Ontario. Names have been withheld under a confidentiality agreement. 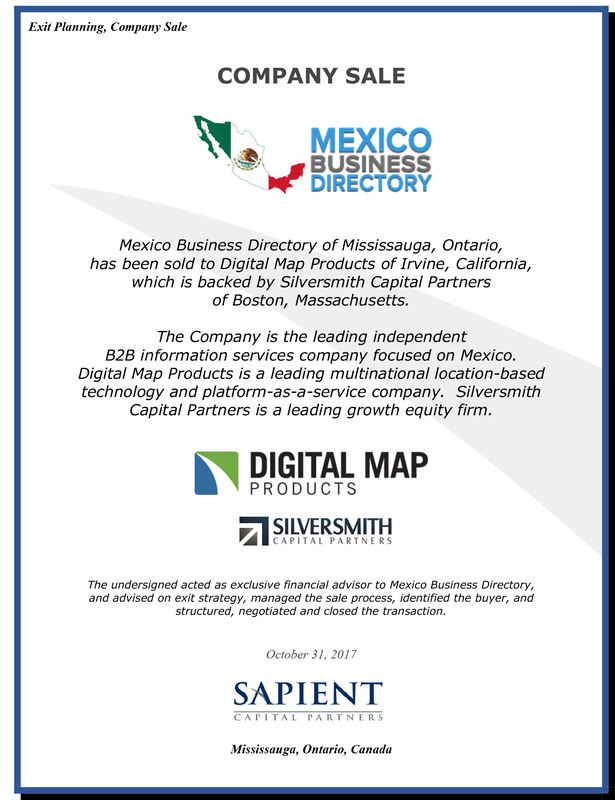 We are a high-growth company operating in 23 countries in a dynamic industry, and Sapient Capital Partners has been an invaluable advisor in the areas of growth and overall corporate and funding/cash management strategy. Kevin O’Neil and his team are creative, experienced and connected advisors, and Sapient has been a true resource for us. We can heartily recommend Sapient to any private companies looking for quality strategic advisory services in areas such as corporate strategy, capital markets, financing growth and managing cash levels, mergers and acquisitions, and shareholder value maximization. 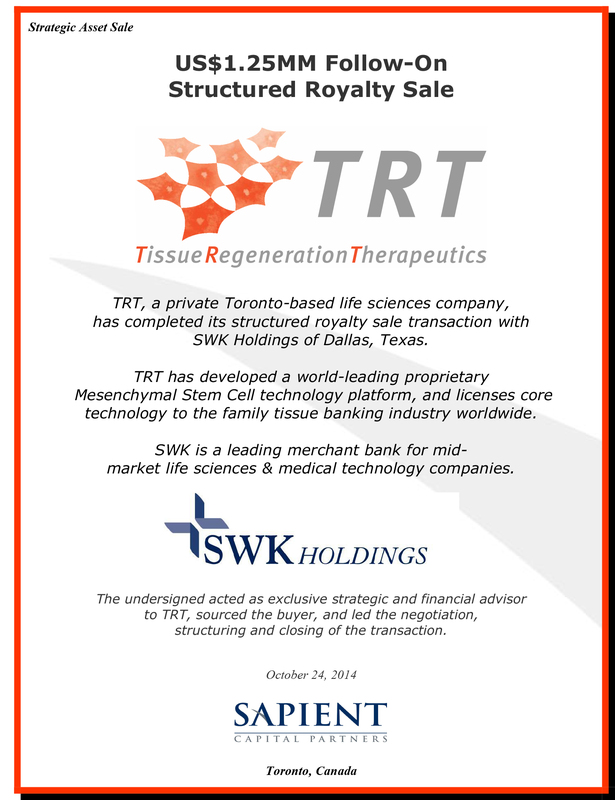 Sapient Capital Partners has been retained as a strategic and business advisor to an integrative healthcare consortium. Entrepreneur of the Year, 2010. Brad is one of the most thought-provoking people I know and he has incredible knowledge to dive into subject matters to gain deeper understanding. It has always been a pleasure to work with Brad, as you know you are getting great value and sound advice. Andrew Ackerman, Serial Entrepreneur & Angel Investor. Brad brings a low-key, relaxed confidence to everything he does. With him, you know exactly what you are getting . . . and you are getting the best. Sapient Capital Partners has been retained by a longstanding private Canadian broadcasting company to advise the owners with regard to shareholder value maximization and exit planning. Sapient Capital Partners has been retained as a strategic advisor to a high-growth private B2C web retail platform and back-end logistics company, to assist with growth and capital markets strategy. Name withheld under a non-disclosure agreement. Brad Cherniak is a high-energy and idea-driven member of our advisory board. He has been a very helpful and valuable sounding board for First Base Group in managing our corporate resources and growth strategy in a difficult economy. Sapient Capital Partners has been retained by an Ontario-based Life Sciences company to advise it on growth and capital markets strategy, liquidity management, and shareholder value maximization. Name withheld under a confidentiality agreement. Sapient Capital Partners has been retained by a longstanding, family-owned chemical company based in Ontario to assess strategic options for the Company. Name not disclosed under a confidentiality agreement. 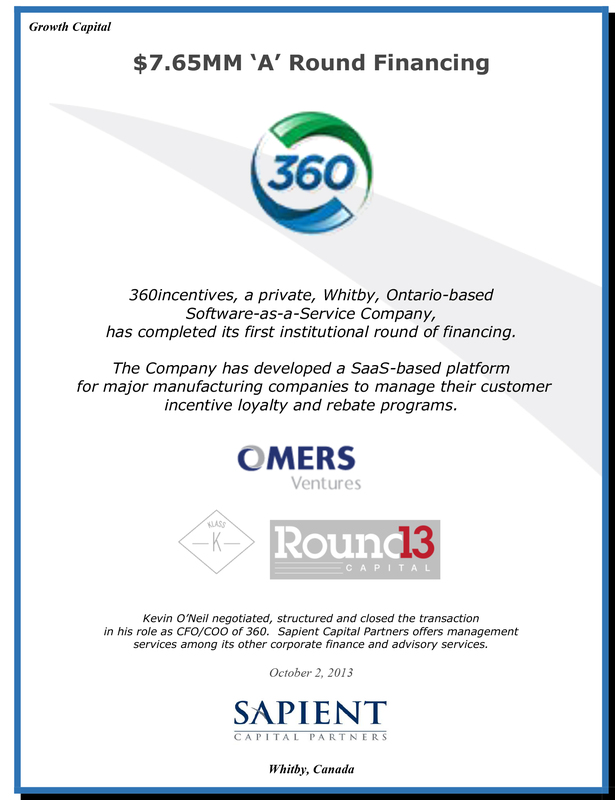 Sapient Capital Partners has been retained by a mid-sized private, Ontario-based building products and services conglomerate to assist with growth and capital market strategies including working capital/liquidity funding, shareholder value maximization, and succession/exit planning. Name withheld under a confidentiality agreement. Sapient Capital Partners has been retained to advise an Ontario-based developer of popular mobile apps for kids regarding the maximization of shareholder value. Name withheld under a confidentiality agreement. 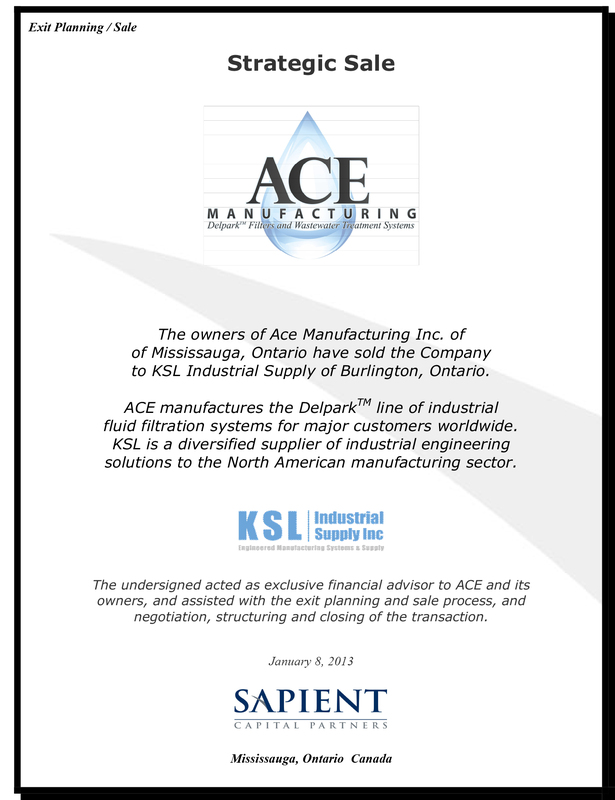 Sapient Capital Partners has been retained to advise a longstanding and profitable family-owned and operated wastewater treatment technology company based in the GTA of Ontario regarding shareholder value maximization. Name withheld under a confidentiality agreement. 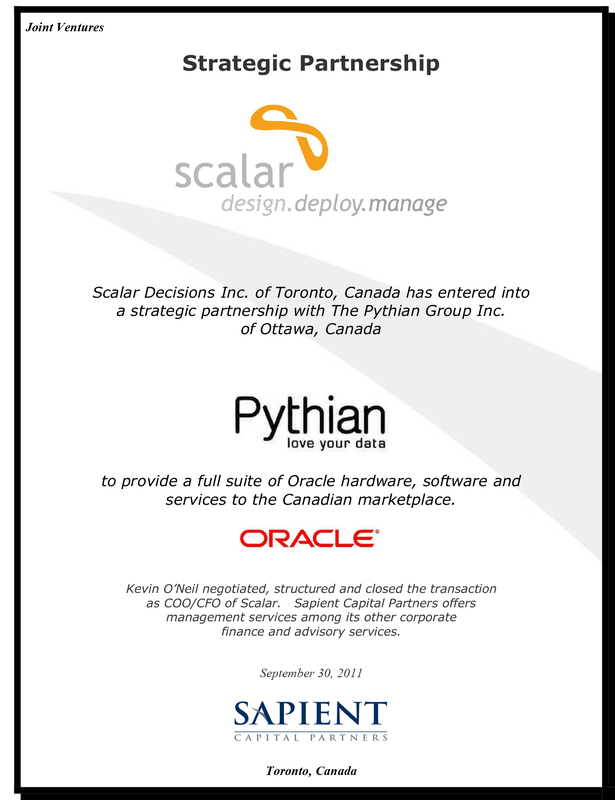 Sapient Capital Partners has been retained to advise a Toronto-based technology company with a proprietary web crawler and related tools for advanced web data extraction and data mining. The Company automates and enhances the retrieval, collection and storage of web-based content of all kinds to facilitate corporate decision-making and to act as a competitive intelligence tool for companies doing business over the web. The Company is profitable, with less than $5 million in sales. Name withheld under a confidentiality agreement. 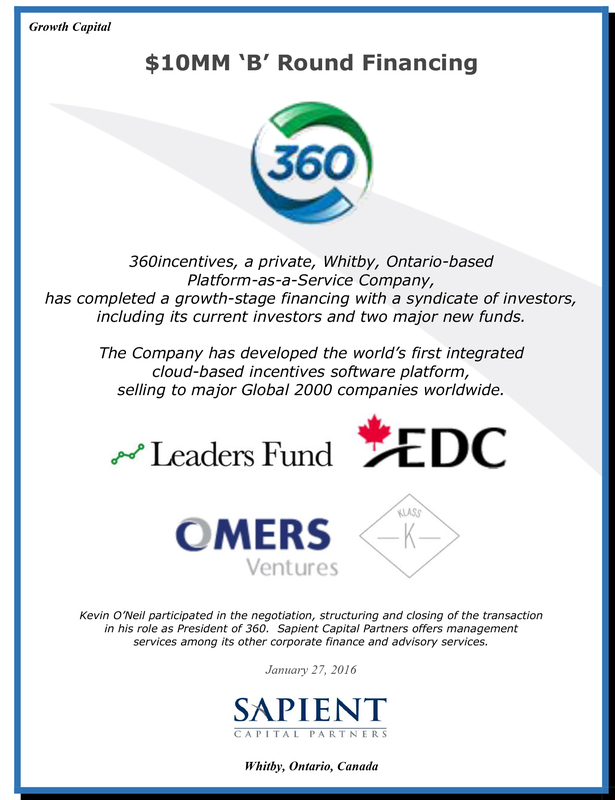 Sapient Capital Partners has been retained to assist an Ontario-based software and consulting services company with its growth and financing strategy. 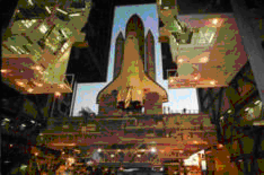 The Company, with less than $5 million in sales and profitable, focuses on production and process optimization for major corporate customers in the aerospace/defense, manufacturing and logistics verticals. Name not disclosed under a confidentiality agreement. 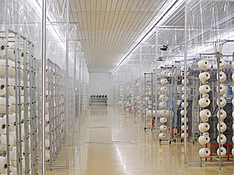 Sapient Capital Partners was retained to advise a 3rd-generation family-owned and run Canadian commercial and residential hardware supply company with annual sales of approximately $5 – 10 million and profitable in regards to the formation and execution of its succession and exit planning strategy. Name not disclosed under a confidentiality agreement. Dan Gagliardi, CEO, Zeebu Mobile Inc. They make good companies better. Kevin is logical and pragmatic and leverages deep financial and operational experience in his approach to business problems. For my company, he has been instrumental as an advisor, mentor and friend and is a guiding force that keeps our company moving forward. Sapient Capital Partners has been retained to provide “Virtual CFO” services to a Toronto-based enterprise IT services company with approximately $40 – 50 million in sales. 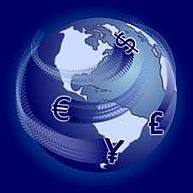 Services include operational and working capital/liquidity management and strategy. Name not disclosed under a confidentiality agreement. Howard Gwin, Chairman, dna13 Inc.
Kevin was absolutely instrumental in the very successful outcome for dna13. He is a very quick study, steady under pressure, thinks outside the box, and is very pragmatic in approach. He helped shift the business model to a more effective deploy model and under tough circumstances (market conditions) did an excellent job. Lisa Savelli, Co-Founder & President, WeMuv Inc.
Brad Cherniak has been a great resource for WeMuv in his position on our advisory board, bringing a unique combination of insights, experience and contacts relevant for high-growth companies like ours. He has added big value to our growth and financing strategies and continues to help us work through a wide range of strategic opportunities and challenges as we move forward. Sapient Capital Partners was retained to advise a leading national chain of delicatessen-style restaurants on strategic tuck-in acquisitions. Name withheld under a confidentiality agreement. 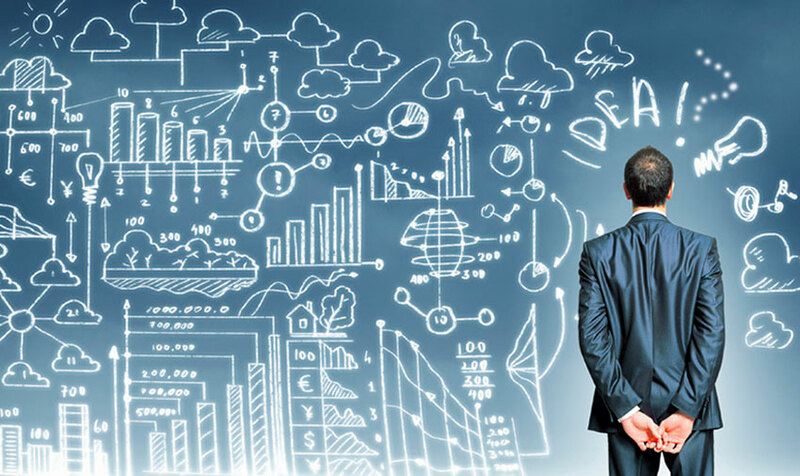 Sapient Capital Partners was retained by a B2C web company with a proprietary software platform and 75,000+ monthly unique visitors to advise on strategic and capital markets issues in order to facilitate the continued growth of the Company and the maximization of shareholder value. Name not disclosed under a confidentiality agreement. 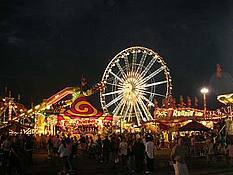 Sapient Capital Partners was retained to sell a long-established, privately-owned Canadian family entertainment company with revenues of approximately $5 – 10 million and a strong track record of growth and profitability. 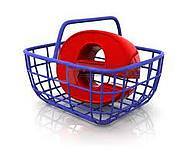 The sale mandate is the result of a strategic advisory assignment to assist the owner with their succession planning. Name not disclosed under a confidentiality agreement. 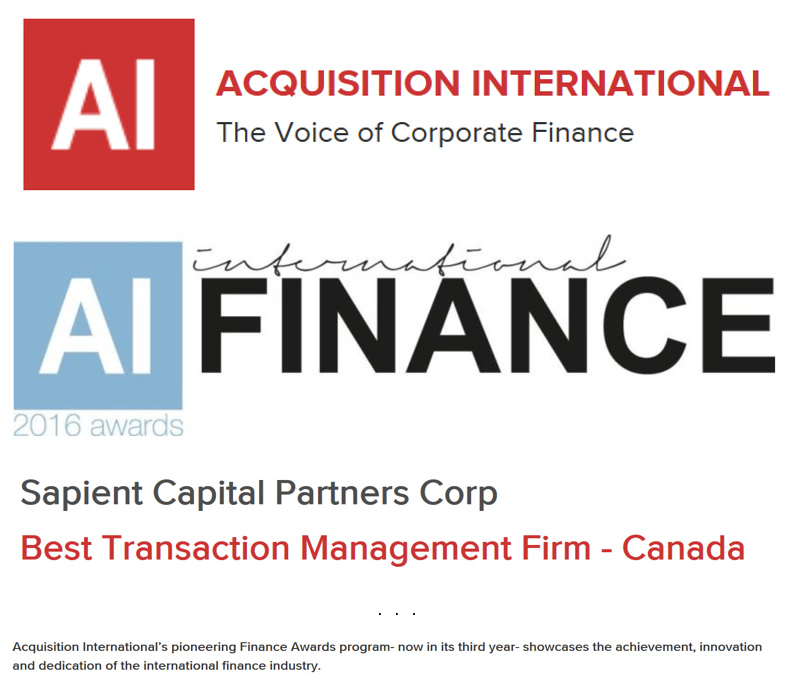 Sapient Capital Partners was retained to advise a high-growth Canadian entertainment systems and eCommerce web applications company with annual sales of approximately $3 – 5 million in regards to strategic and capital market alternatives to support its continued growth. Name not disclosed under a confidentiality agreement. Sapient Capital Partners was retained to advise a long-established Canadian apparel company with annual sales of approximately $20 – 25 million and profitable in regards to a sale to a U.S.-based strategic buyer. Names not disclosed under a confidentiality agreement. Brian Semkowski, Co-Founder & President, Southwest Sun Group, Inc. The team at Sapient Capital Partners was very helpful to us in assessing two recent investment situations and thinking through all aspects of the companies and the risks and challenges that they provided. They helped us look at several proposed deal structures and ultimately helped us to make the right decision for Southwest Sun. 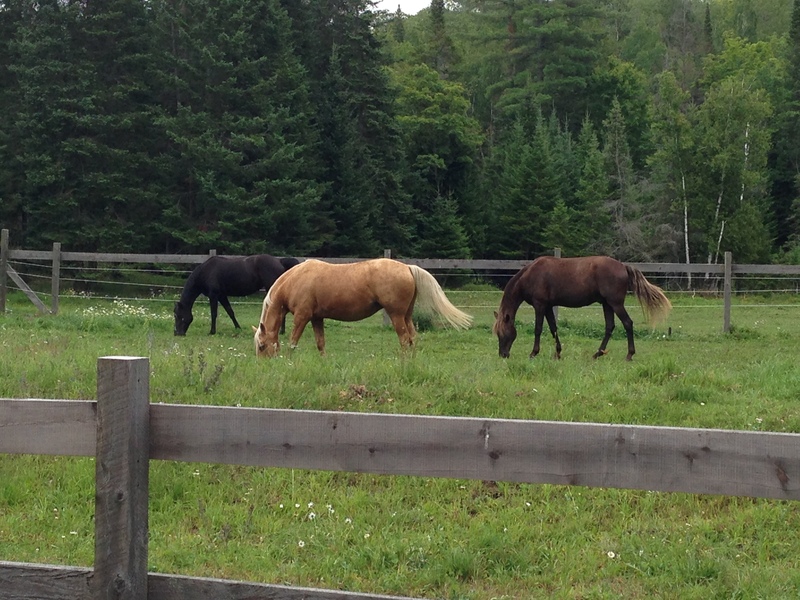 They moved quickly and knew exactly where to look and what questions to ask. We would use them again, particularly as the global economic situation makes private risk capital ever more risky and complex! 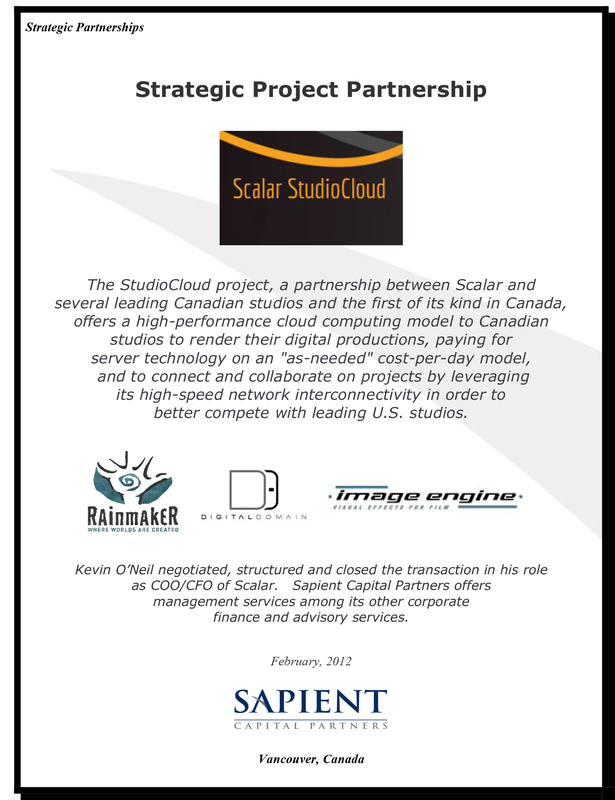 Mr. Paul Kerr, Chief Executive Officer, Scalar Decisions Inc.
Sapient Capital Partners did a great job for Scalar in advising on and executing our first acquisition. They helped us to analyze and value the target, assess the merits and risks of the transaction, negotiate the best possible terms, and structure the deal with a practical eye to integrating the two companies in a way that minimizes Scalar’s risk but still provides mutual value and upside potential. Their advice has been valuable to us and always on the mark. Kevin MacNeill, Co-Founder & CEO, Elephant Factory Inc. These guys know their stuff and are an invaluable resource for smaller, high-growth technology companies trying to negotiate strategic deals with larger companies or major multinational corporations as customers, joint venture collaborators or channel partners, not to mention suppliers or competitors–sometimes all at the same time! 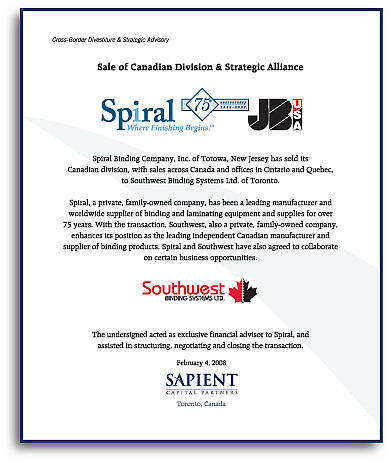 Robert M. Roth, CEO; Stephan A. Roth, EVP, Spiral Binding Company, Inc.
Sapient Capital Partners was a tremendous partner to Spiral Binding in the sale of our Canadian operation. They were instrumental in getting us the terms that we were seeking and in managing the ups and downs of the transaction process and negotiations–with their experience and expertise showing through. Sapient delivered the goods for Spiral Binding. 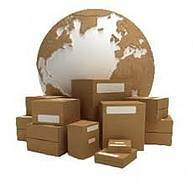 We would heartily recommend them to anyone seeking strategic advice regarding their companies. Val brings together a unique combination of skill-sets and interests in the Canadian financial community. During the time that I’ve spent with him in exploring a number of options earlier in my one of my previous companies, he demonstrated an interesting combination of business acumen with a willingness to explore interesting emerging technologies. 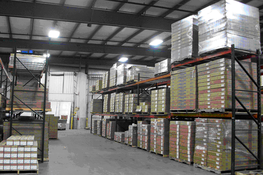 Kevin G. Tallman, Dealer Principal, Western Toronto International Trucks Inc.
Sapient were able to get their heads around all the key elements of our business quickly and effectively. They grasped complex issues and provided us a robust valuation analysis of our business to help facilitate a transaction. 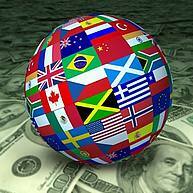 We are impressed with their technical skills and their transaction advice. Bryan Bogensberger, Founder & President, Marketingisland.com Inc.
We have a rather complex combination of traditional and technology-driven business lines, and really needed help to sort out our corporate vision and core strategies and tactical plans. Sapient Capital Partners was invaluable in helping us to really think through and hone these key elements. The result was to get Marketingisland ready to reach the next phase of growth and maturity with new financial and strategic partners. Sapient’s partners are easy to work with and have valuable practical insights coming out of a wealth of experience. 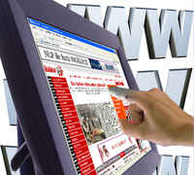 They are an excellent resource for high-growth companies. Thomas Birch, Managing Partner, Propulsion Ventures Inc.
Good guys with interesting deal flow. 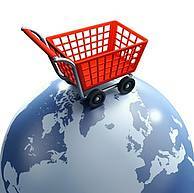 They were very knowledgeable about the company and understood the standard VC prerequisites. 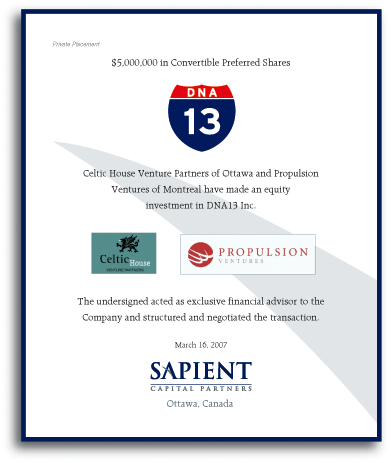 Chris Johnson, Founder & CEO dna13 Inc.
Sapient Capital Partners really came through for dna13, helping guide us through the Canadian and U.S. venture capital markets, and our ultimate transaction with two leading funds. They provided high-value advice and their experience showed throughout the process–no matter what challenges we encountered. They spared no effort on our behalf, and backed up their advice with excellent, detailed analysis where it was required. Their advice was also objective and unbiased—they gave me the unvarnished truth when I wanted it over the course of negotiating and executing the transaction. I would highly recommend them for any company looking for strategic advice, or looking to finance its growth. Steven Bogensberger, Founder & CEO SIMPLEPLAY INC.
Sapient Capital Partners has been indispensable to SIMPLEPLAY as our strategic advisor. 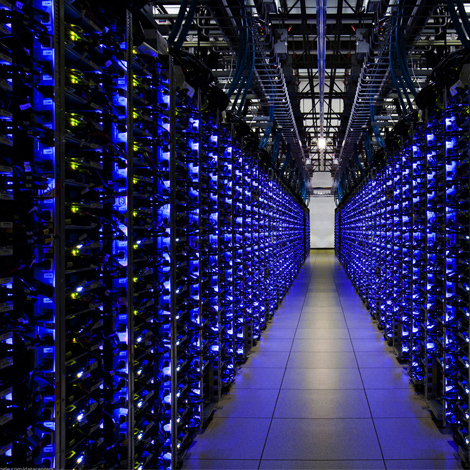 They have helped us to hone our strategy and position the Company for growth, and for the capital markets. They have a wealth of experience, insights and contacts to cover all aspects relevant to high-growth companies. Would not hesitate to recommend them. There were so many variables to assess in order to make the right decisions as to whether and when to sell my business, to whom, and for how much. Sapient really helped me to properly sort through everything and ultimately get to a successful resolution at an excellent valuation, to allow me to focus on new endeavours. 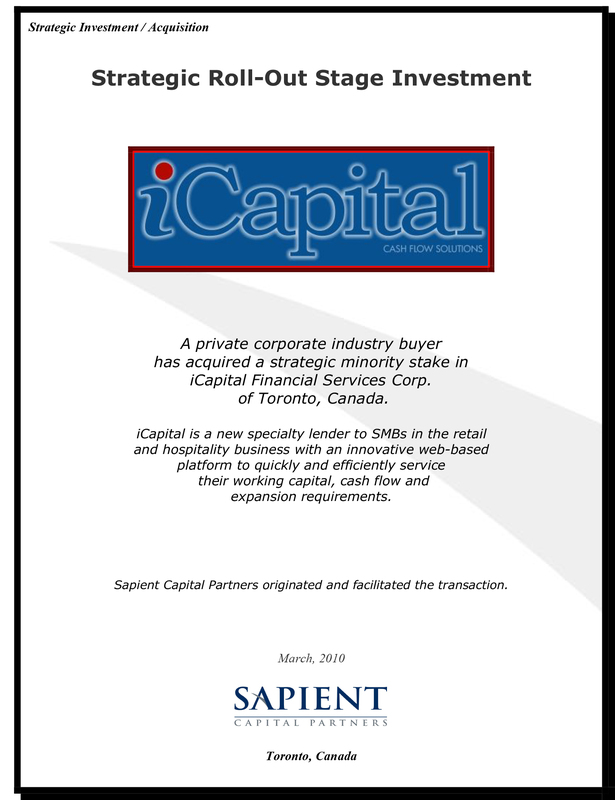 I would strongly recommend Sapient Capital Partners to any business owners looking to realize on their investments. 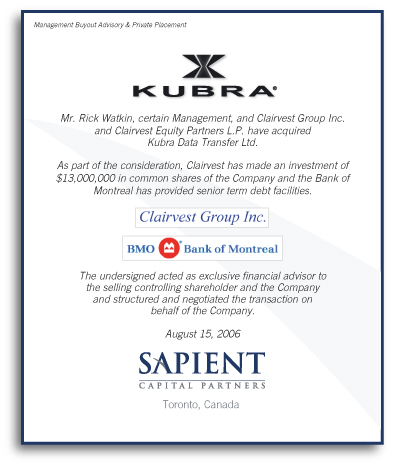 Michael A. Wagman, Managing Director, Clairvest Group Inc.
We appreciated the professionalism, diligence, experience and judgment of Sapient Capital Partners during our negotiations in the course of making our investment in KUBRA. We look forward to working with them again, and would not hesitate to recommend Sapient as corporate advisors. As a company in a dynamic industry with a lot of strategic opportunities and options and not a lot of time or resources to evaluate them, it was invaluable to receive the advice and analysis of Sapient Capital Partners. The experience and insight of their senior partners really showed through in their recommendations and ongoing advice over the course of their Strategic Assessment for KUBRA and the subsequent transaction with Clairvest. They were practical, effective and quick on the draw. Bottom line, Sapient Capital Partners has been a great partner to KUBRA. We would have no hesitation to recommend them to private companies who need good independent financial, strategic or capital markets advice. I needed quick, effective, independent advice when evaluating a strategic investment opportunity which arose with a tight timeline. Sapient Capital Partners provided me with unbiased analysis and insights which allowed me to make the right decision–they drove to the heart of the business and quickly identified the key issues. I was impressed by their frank advice and their putting my interests ahead of theirs in providing it. James Coughlin, VP Sales & Marketing and General Manager, Team Sport Division Igloo Vikski Inc. I had a strong vision of the company I wanted to create in my MBO. Sapient Capital Partners helped me flesh out my vision, determine the corporate structure and the terms of the deal, and gave me a realistic sense of what I could expect, bringing a depth of experience with the needs and requirements of institutional investors. And a real pleasure to work with. Highly recommend them. Ken Simpson, President, K Simpson Sales & Marketing Inc.
My company, after 28 years in business, found itself in difficulty and in need of an unemotional, outside evaluation and strategy. Sapient Capital Partners helped guide me through a very difficult period in my business. They entered the picture, quickly got a handle on the issues, and skillfully dealt with the restructuring of my business. Sapient is a firm that can not only analyze a complex situation quickly, but also wade in effectively and deal directly with the complexities and personalities involved to get the job done. 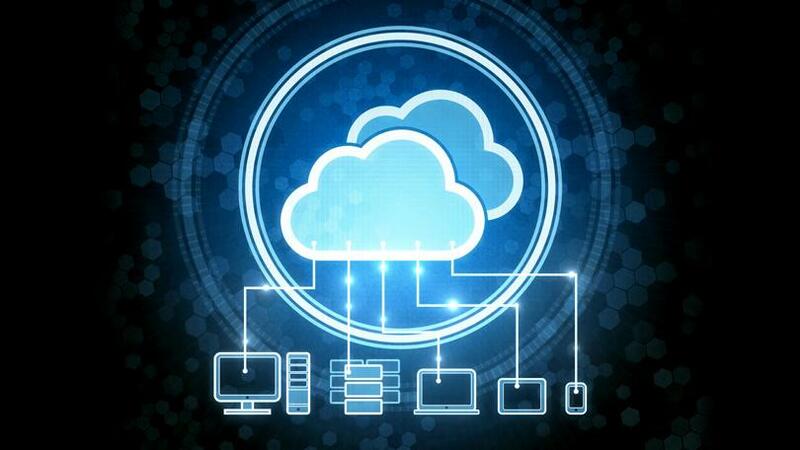 Sapient facilitated a one-stop service including marketing, personnel, financial, legal and strategic. 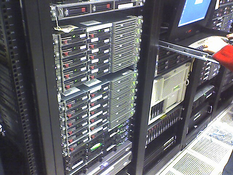 Sapient did the necessary job and got us up and running on a new path in less than 6 months. I would wholeheartedly recommend Sapient as an advisor to private businesses.